What The Hell Are The Lakers Doing With D'Angelo Russell? There are two things wrong with that statement, one defensible and one not. Porzingis, who was taken fourth by the Knicks, obviously still has room to grow, but so far he has been an above average NBA player. The Lakers’ analysis of him was wrong, and Scott admitted as much. But much more puzzling, the Lakers’ thought process regarding Porzingis indicates that they believed they would be a playoff contender this season. That’s the only reason Porzingis needing time to develop would be a downside, after all. Anybody with a modicum of basketball knowledge could see that the Lakers were going to struggle this season. As one good example, ESPN’s Summer Forecast—which aggregated the predictions of over 200 NBA writers—predicted the Lakers would finish 26-56, 14th in the West. So far that prediction has been borne out, as going into tonight’s game the Lakers were just 1-5, with the solitary win against the Brooklyn Nets, one of two teams without a win this season. In other words, what in god’s name was the Lakers front office looking at that indicated they were so close to competing that they couldn’t draft a talented project big man they liked? With their second pick, the Lakers chose D’Angelo Russell, a perfectly fine choice. Except D’Angelo Russell, drafted in part because he was supposedly ready to play, has struggled. 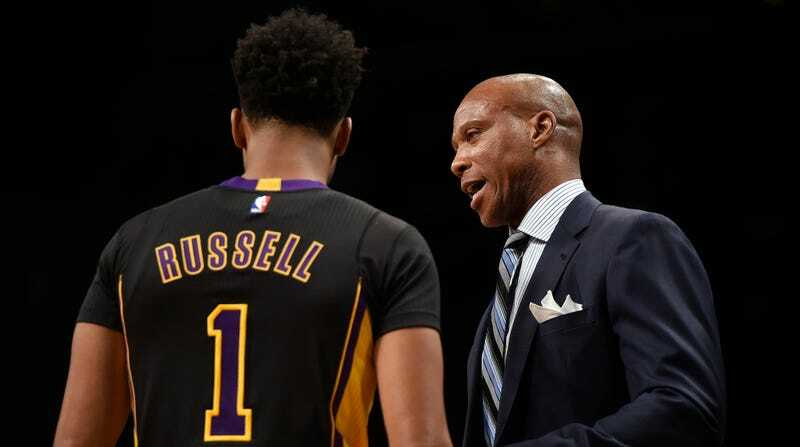 Byron Scott has warned him that he needs to improve if he doesn’t want to see a decrease in playing time, and has benched Russell in favor of Lou Williams in the fourth quarter of close games. Which brings us to tonight’s game, which saw the Lakers get whooped by the Heat, 101-88. On the road, without Kobe, the Heat lead was as big as 18 in the fourth quarter, yet the number two overall draft pick never even saw the floor. After he left the game with 4:52 remaining in the third quarter, Russell never returned. Russell wasn’t particularly good in the 21 minutes that he did play, and after the game acknowledged that he needs to be better. He also said that Scott gave him no explanation for why he didn’t play the final 17 minutes. Scott did explain why to reporters, but it didn’t make any more sense. Miami had too big of a lead? So if Russell can’t play in the fourth quarter of close games, and he can’t play in the fourth quarter of blowouts, when can he play in the fourth quarter? This debacle isn’t only, or maybe even mostly, Byron Scott’s fault. He isn’t the one who signed an old and mediocre-at-best Kobe Bryant with a torn Achilles tendon to a two-year, $48.5 million contract two seasons ago. He isn’t the one who made a terrible pitch to free agents during the offseason. He isn’t the one who decided to draft the supposed win-now player over the supposed project. His job isn’t to set the strategy the franchise will follow, but to implement it. With that qualming out of the way, Byron’s tactics here are absolutely baffling. The Lakers are garbage and Russell, along with their other young talents like Julius Randle and Jordan Clarkson, should get as many minutes as possible. He should absolutely be playing in the fourth quarter of blowouts, and also the fourth quarter of close games. That is the quickest way for him to improve. The Lakers will have somewhere in the neighborhood of $60 million in salary cap room next season, and the operating assumption is that because of the Lakers’ allure and Los Angeles’s Los Angelesness, they’ll reel in a couple of top free agents. But because of the booming salary cap they’ll face stiff competition from nearly every other team, and with money the same either way, most of those free agents will be choosing based on perceived competitiveness. If the Scott continues to make Russell ride the pine and stunt his development in pursuit of a 30-win season rather than a 27-win one, the negative effects could reverberate for years to come.